This meeting is all about expanding your knowledge of paper and starting a notebook of Paper Samples where you can keep track of papers you use, their attributes (such as colors, dimensions and weight), and where to purchase them. You will begin several pages of your sampler at the meeting as we talk about how to select papers for specific book-making purposes. We hope you will join us at our first NBG Program Meeting of the year on Sunday, January 21 from 1:00 to 3:00pm at the Pioneer Park Blue Room. We will create an eye-catching wall calendar. Holiday time is star time! This month’s program will pave the way to a galaxy! 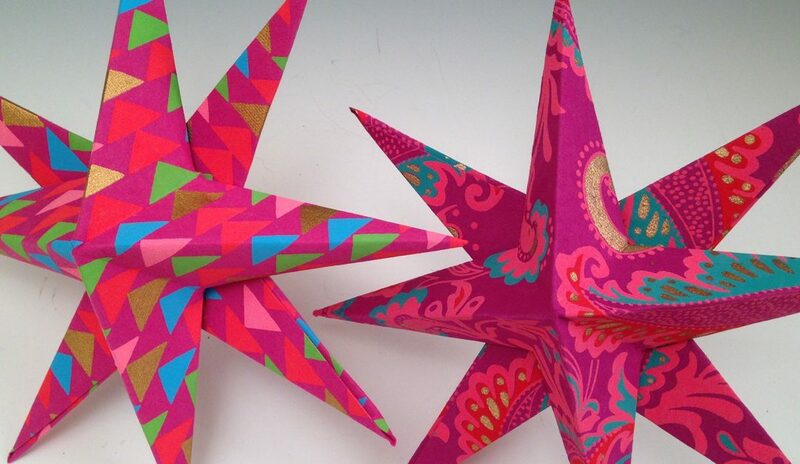 Using beautiful heavy weight papers we will learn, step by step, how to make an easy but elegant eight-pointed star. You’re invited to be inspired and informed at this Annual Meeting! Thursday, May 25, 5-7PM at the Social Hall in the Christ Lutheran Church. The location is on the corner of Farmer’s Loop Road and Iniakuk Ave. This meeting offers a refresher class on making wraparound casements for your books. Rescheduled from January, this NBG meeting will focus on getting ready to meet the challenge of Books as Art 2. Participate in the “Map Books” exchange, bring your annual membership renewal payment, and a list of waxed linen colors you’ve been looking for!